On Twitter, "Emma," a librarian, writer and blogger, Tweeted, "Quote & RT with your top 5 books of all time. Don't think about it, just follow your heart." 1. Illuminatus! Robert Shea and Robert Anton Wilson. 2. Pride and Prejudice, Jane Austen. 3. Lord of the Rings, J.R.R. Tolkien. 4. 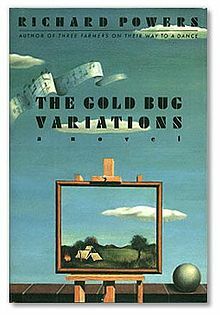 The Gold Bug Variations, Richard Powers. Of course, the nature of such an exercise is that one has second thoughts. Should I have listed The Book of the New Sun by Gene Wolfe instead? Where is Pale Fire by Vladimir Nabokov, and Nine Hundred Grandmothers by R.A. Lafferty and Excession by Iain M. Banks?